Was it the hair color product or the careless person using the product that broke your hair off? It was the lack of education of the person using the product that caused the breakage. The product can break the hair if it is used over the wrong type of hair. When product is used over damaged hair you can count on more damage …often seeing more breakage. I talk with women all the time who still think it’s the product that is damaging their hair. I want to ask them, “It it the cake on the plate that causes us to gain weight?” Or is it the piece of cake we take off the plate and put a blob of ice cream on and then eat that’s causing us to pack on the pounds? Although this distinction seems very simple and straight forward to me, some women are still perplexed when I explain it like this. This is really very simple. The hair color product is harmless while it still remains in the tube or bottle. The damage comes in when someone takes the contents and starts to mix them or apply them improperly. 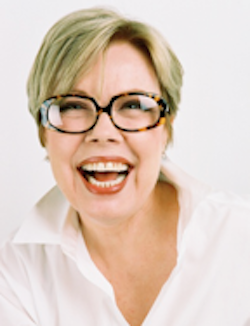 Among professional colorist, the rule of thumb is that the product being used is not the root of hair damage. This being said you will see even in the best of salons hair color being done by the “STAR” breaking off highlights day after day…and charging huge prices for the service. This person using the product is causing the damage to the hair. Often when this happens the problem is blamed on the unconditioned hair that the person was working on. The truth is the damage is caused either by using the product incorrectly, or by not selecting the correct product for the hair it is being used on. If the hair being processed is already highly damaged, the person using the product will be causing even more damage by applying any additional chemical to the hair. 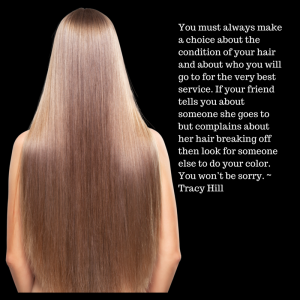 You must always make a choice about the condition of your hair and about who you will go to for the very best service. If your friend tells you about someone she goes to but complains about her hair breaking off then look for someone else to do your color. You won’t be sorry.